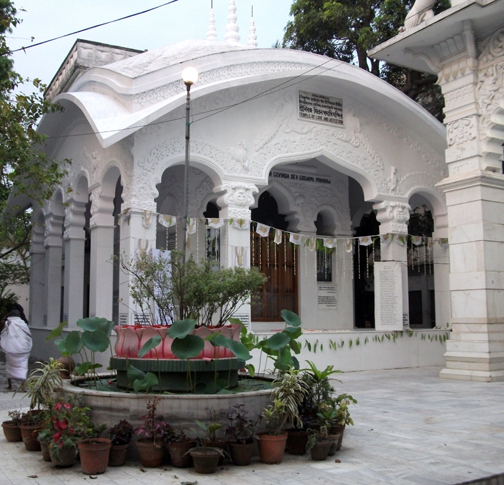 The Samadhi Mandir’s name was personally chosen by Srila Bhakti Nirmal Acharya Maharaj. The name refers to the love and affection that Sria Govinda Mahārāj personified and exhibited in his relations with all souls, as well as the love and affection he received and appreciated over the course of his life from his own Gurudev, Srila Bhakti Raksak Sridhar Dev-Goswami Maharaj. The marble walls of the Temple of Love and Affection are adorned with one hundred and eighty seven verses collected from the scriptures of pure devotion and the writings of the Rupanuga-guru-varga. The criterion by which the verses were selected had two primary elements: (1) verses which served as the bases of prominent themes within the overall compass of the preaching of Srila Govinda Maharaj, and (2) verses which Srila Govinda Maharaj personally relished and for which he had special affinity. The collection of verses was also compiled with reference to the verses which adorn the Temple of Union in Separation and effort was made to avoid repetition of verses on both temples, with a few noteworthy exceptions. In an extended series of posts, we are gradually presenting the verses which adorn the Temple of Love and Affection in roman transliteration and English translation, accompanied by explanations and commentaries relevant to the verses which have been given by Srila Govinda Mahārāj himself or our other acharyas. Our hope is that by presenting these verses, fortunate souls will be able to deepen their appreciation for the mood of devotion that animates the heart of Srila Govinda Maharaj. Please click here to view the verses.